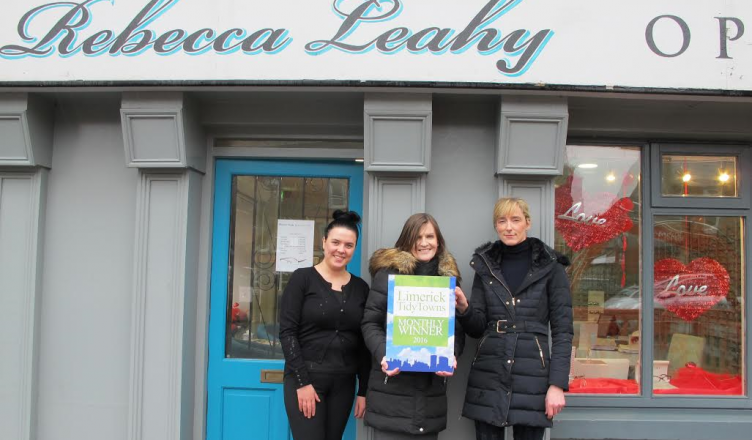 Limerick Tidy Towns monthly award for February 2016 has gone to Rebecca Leahy Opticians at 2 Greenville House, O’Connell Avenue, following a nomination from a member of the public. Pictured outside the premises being presented with the award by Maura of Limerick Tidy Towns are Rebecca Leahy and Katie Hanlon. 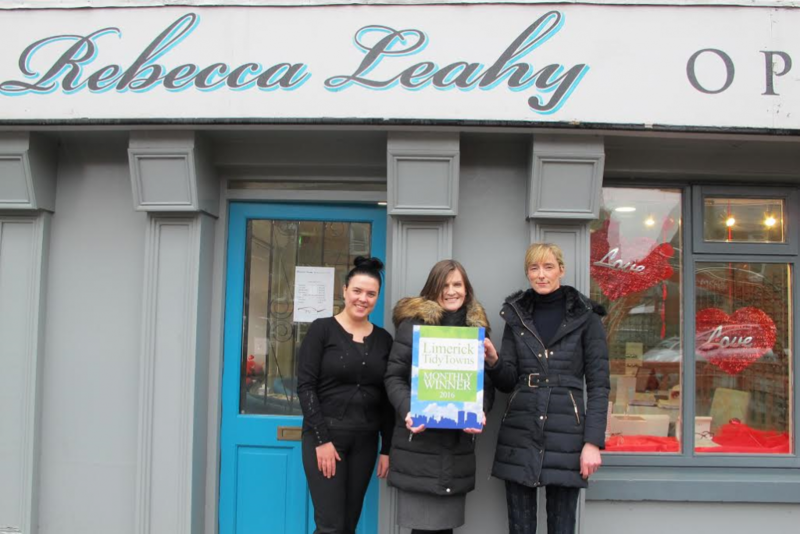 Rebecca Leahy Opticians was originally brought to our attention by a member of the public last year, as they always have such attractive window displays and the shop has transformed what was a previously neglected corner of O’Connell Avenue, a very busy access route to the city centre. However, as we had already given an award to a nearby business we decided to wait until this year in order to recognise Rebecca and her team, and happily they have continued to maintain the premises so are fully deserving of an award. This month in particular, their Valentines display looked great and was just one of their many eye-catching window displays which really brighten up the street environment. Credit must also go to the South Limerick Residents Association for continuing to ensure the outside area is also consistently kept litter free. It is no coincidence that so many properties in this area of town are winning our monthly awards. Rebecca Leahy Opticians first opened in 2013, having totally transformed and refurbished their unit on this previously derelict corner of O’Connell Avenue and Clontarf Place. They provide an excellent service in eye-tests and contact lens fitting, with a wide range of competitively priced spectacles available for both children and adults, including many designer labels, in a most pleasant welcoming environment. For further details or to make an appointment contact them on 061 590020, or simply drop in. Rebecca Leahy Opticians is the second Limerick Tidy Towns monthly award winner for 2016, following Silverwood Jewellers in January, and as in this case, if members of the public wish to suggest future monthly winners in 2016 which they feel merit the award, please do let us know. An overall winner for 2015 will also be chosen a special awards ceremony this month so watch this space! As ever, many thanks to Sarah O’Connell of I Love Limerick for taking the photographs for this and all of our monthly awards.